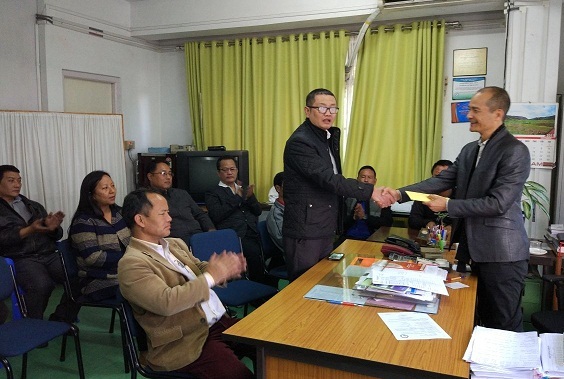 MJA president handing over cash to Aizawl Civil Hospital. Photo: S Hmar. NGOs in Mizoram doled out Christmas charity among the people of the state. Christmas came early for the under privileged across Mizoram with larger NGOs of the state doling out charities. The Mizoram Journalists Association (MJA), the Central Young Mizo Association (CYMA), Cancer Care Foundation are there in the list of early santas to dole out their charities across the town. Donations from journalists in Aizawl amounting to Rs. 1.06 lakhs was handed over to Aizawl Civil Hospital’s medical superintendent on Thursday by Vanlalrema, president of the MJA. The money will be distributed among civil hospital poor fund and Mizo welfare bodies of Mumbai, Vellore and Guwahati. “God gave us his son for us on Christmas, it is our duty to give what we have to the more needy ones, this is the true spirit of Christmas,” Vanlalrema Vantawl said. District headquarters of MJA also doled out charity funds to the sick and the needy in their respective districts. Various charity institutions and the poorer section of the society across the city have been benefitting from charitable acts of NGOs in the past too. This year is also no different. The CYMA has doled out Rs. 1.49 lakhs to several charity institutions in Aizawl. The recipients of the CYMA’s charity include Bethel Camping Centre, Thutak Nunpuite Team, Cancer Hospital, Motherless Babies Home, Sinner’s Friends and a few more charitable institutions. Mizoram police doling out charity for Christmas. 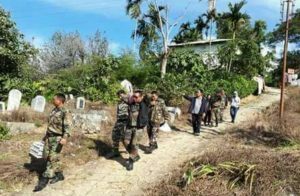 The Mizoram Police too, despite their mammoth tasks of enforcing law and order in the state is not lagging, donations from police personnel amounting to Rs. 2 lakhs was handed out in kind and cash to the needy. “Most of the families we’ve helped were given money while some were given rice, cloths, blankets and the likes,” a police officer in charge of the charity said. 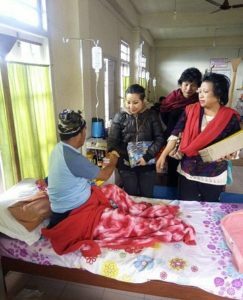 Cancer Foundation of Mizoram distributing Christmas gifts among patients. Cancer Care Foundation of Mizoram on Thursday visited cancer patients at Cancer Hospital here in Aizawl and gave them Christmas presents. “Giving them presents and money was one thing, what we really wanted was to wish them a merry Christmas and many more Christmas to come. Most cancer patients need to know that cancer should not be viewed as a fatal disease, we tried to make them understand that it is just another disease which is curable,” Mazami, general secretary of Cancer Foundation of Mizoram, who herself is a cancer survivor, said.